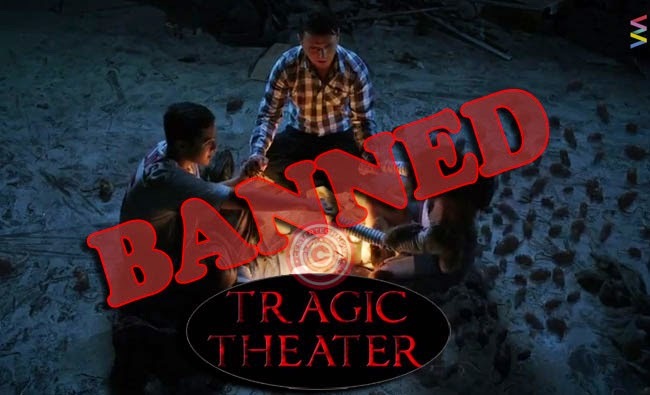 The trailer of Andi Eigenmann, John Estrada, and Christopher de Leon’s January 2015 horror movie, ‘Tragic Theater’ had been banned by Movie and Television Review and Classification Board (MTRCB) for being ‘too scary’. The trailer of ‘Tragic Theater’ directed by Tikoy Aguiluz had been deemed not fit to be aired on national television and on cinemas by MTRCB and gave it a rating of X. This news had surprised Aguiluz as it had been rejected twice. The rating of ‘X’ means that the any motion picture including trailer, television program or publicity materials is not to be viewed by the public. There are many reasons for a material to be rated as X. It could be too violent, attacts race or religion, glorifies crime and others, but Aguiluz claims that the movie trailer is not too violent. Aguiluz furthermore explained that the trailer was meant to be scary as it is a horror movie. The producer, Viva Films published the trailer in YouTube on December 12 as the internet is not under the jurisdiction of MTRCB. This leads the viewers to give their own opinions about the trailer. The movie ‘Tragic Theater’ is based on the novel written by G.M. Coronel about a an exorcism of a theater with gruesome history. After a tragedy that killed workers at the beginning of the theater’s construction the spirits seemed to have remained in the place and haunted the area ever since. Andi Eigenmann was shown in the trailer to have elevated in the air and possessed by an evil being. Theater chairs zoomed across the place and ghosts were shown. Some netizens say that the movie is even good and could compete internationally. MTRCB is yet to release their statement about the issue.